Section 9 of the French Broad (known widely as FB9) has historically meant from the Madison County put-in in Barnard to one of the take outs in Hot Springs. Probably 90%+ of all trips on FB9 are from Barnard to Stackhouse. Maybe I should call this section 9A. The reasons for this are fairly simple; from Barnard to Stackhouse the river has fairly evenly dispersed class 2 and 3 rapids and the run is consistent. If you paddle below Stackhouse, you paddle 4 miles of mostly flatwater for 2 good rapids, class 3 Kayak Ledge and Class 4 Frank Bell's. Most paddlers comfortable on class 4 probably don't think it worth the price. I have put 700 cfs as the minimum flow since you can run from Barnard to Stackhouse without dragging if you are careful in choosing your line. I know of people who have made the run as low as 350 cfs, a goodly amount of scraping on rocks must have been involved. I would have to be desperate to run it that low. I would recommend 1200 as a minimum to continue past Stackhouse on to Hot Springs. Kayak Ledge and Frank Bell's are located on the right sides of two fairly large islands. There is a distinctive rock spire at the upper end of the island as a marker for Kayak Ledge. If some in your group are not ready for Kayak Ledge or Frank Bell's the left sides of both islands have much easier routes. At Kayak Ledge most of the flow goes to the left of the island. Below Kayak Ledge the river is divided into several channels by smallish islands. After the channels join, the river is in a wide pool above Frank Bell's (where most of the flow goes to the right of the island) You can scout Frank Bell's from near (on) the RR tracks but you won't get a great view. At levels above 3500 the river gets pushy, above 5000 there are substantial boils and wierd cross currents and a few mean holes. For those coming from out of town (or even locals) not wanting to bring two vehicles there are shuttle services available. Matt & Jemima who own the Laurel River Store on Big Laurel Creek, a couple miles away can arrange or put you in touch with shuttle services. Their e-mail is laurelriverstore@gmail.com and phone number is 828-260-6462 an alternate number is 828-773-1053. I left this old description below in as it is still somewhat informative. Photo: Lori & Dean Geis at Kayaker's Ledge, courtesy of the Monocacy Canoe Club. The gauge closest to the put-in is the French Broad at Marshall. This gauge is not available on the TVA's flow line (800-238-2264) or flow page (TVA Streamflows), though the French Broad at Asheville and the French Broad at Newport are. The level on the Marshall gauge is usually about half way between the levels on the Asheville and Newport gauges, unless there has been a big rain upstream whose waters have only just begun to move down the river. Directions from Asheville (to take-out): 43 minutes. Head north out of Asheville on US 19/23. Take the US 25/70 (Marshall) exit. Follow US 25/70 all the way to the outskirts of Hot Springs (this will require making a left turn to cross the Big Laurel -- if you are a typical paddler you will park after making the turn and check the gauge painted on river left beneath the bridge). Just before crossing the bridge into town, turn right, then left to go under the bridge and upstream to the rafting outpost parking area. Directions to the alternate take-out at Stackhouse: Head north out of Asheville on US 19/23. Take the US 25/70 (Marshall) exit. Follow US 25/70 19 miles to State Road 1139/1319 (Stackhouse Road). Look for it on your left shortly after you pass USA Raft. Turn left and follow Stackhouse Road downhill all the way to the river. Shuttle: 20 minutes each way. Retrace your steps back to the "T" intersection after the bridge over the Big Laurel. Turn right with US 25/70 to continue retracing your steps all the way to the State Road 1151 (Barnard Road). Turn right onto Barnard Road and follow it downhill all the way to the river (be alert, there are some twists and turns). The put-in is on river right just upstream of the bridge. Camping: There are camping and lodging opportunities aplenty in Hot Springs. My family and I like the Rocky Bluff USFS Campground (828-622-3202; open the Rocky Bluff file with the free adobe acrobat reader). Open May 1 to October 31, this campground has a short nature trail running alongside Spring Creek. To get there, take NC 209 South three miles out of town, heading toward the put-in for Spring Creek. Campsites cost $8 a night. To learn more, check out Gorp's Rocky Bluff page. Other campgrounds include the Hot Springs Campground, conveniently located on the river and the USFS's Silvermine Group Campground (828-689-9694). There are many, many rustic bed and breakfasts in Hot Springs. I know several paddlers who have been married at The Duckett House, for example, and another couple who were married on Max Patch but had their reception at the Rock House. The most unique bed and breakfast, however, has to be Elmer Hall's Sunnybank Inn (828-622-7206). Extremely popular with AT through hikers, a stay at Elmer's includes a family-style vegetarian dinner and breakfast and a chance to converse with an extremely eclectic assortment of guests. In a former life Elmer was a Methodist minister at Duke University; his library is extensive. Most find the Sunnybank Inn through word of mouth. Here are some of those words: Google Search on Elmer and the Sunnybank Inn. And for the two of you who are chomping at the bit for pricier accommodations, here are a couple additional Hot Springs lodging options. Other: Frank Bell's Rapid is named after one of the pioneers of southeastern whitewater. I'm often asked if we're related, and while he's someone I'd love to be able to claim, to my disappointment we're not. Learn more about this fascinating character by reading reading Gordon Grant's 1993 Obituary for Frank Bell Senior. Guess how Hot Springs got its name! Consider reserving yourself a tub at the Hot Springs Spa (828-622-7676 or 800-462-0933; see the price list in the preceding link). The most private tubs are numbers 5 & 6. Most paddlers take out at the rafting outpost on river right 1/3 mile upstream, but if you timed it right you could paddle directly to the tubs on river left. Retrieve the bottle of wine from the truck, change out of your river clothes in a changing room, shower, and relax in a hot tub. What could be finer? You can even reserve a massage! Do a Google Search on Hot Springs and you'll get a lot of interesting hits. I've found the Sherpa Guide to Hot Springs useful, and Hot Spring's history interesting reading. Consider timing a trip to the French Broad to coincide with the annual French Broad River Festival. This is a great run for intermediate paddlers. Its greatest challenge for those beginning to build their skills is its width. It is only slightly harder than the Nantahala if one sneaks the two most difficult drops, Kayaker's Ledge (III at all but high levels) and Frank Bell's (IV- at all but high levels). Both are easily sneaked: they occur in the channels on the river right sides of large islands. Run the left sides of the islands and you'll miss them entirely. Kayaker's Ledge comes at the end of the long, flat, relatively shallow section of the river called Windy Flats. Windy Flats begins below Stackhouse, about the point the railroad tracks cross Big Laurel Creek. The island on whose right side Kayaker's Ledge forms is about 130 steep feet high and occurs at a sharp right hand bend in the river. Scout Kayaker's Ledge before running it -- it creates an obvious horizon line. The pair of small islands on whose right sides Frank Bell's Rapid forms are located about a half mile below Kayaker's Ledge and about a quarter mile below the last of the series of small islands below the main island at Kayaker's Ledge. There is a great ender spot at the bottom of Frank Bell's, a good enough spot that in the days when enders were king we'd sometimes walk our boats the 2/3rds of a mile up the railroad tracks from the end of the road on the river left side of the river just to do them. If memory serves, 1,000 cfs was the optimum ender level. 300-700 cfs Super low Lots of rocks, and even the plants growing on the rocks are visible. Interesting to see once or twice, but not a lot of fun. At 300 cfs some rapids are very interesting just to get through. 700-1,300 Low At this level, there are plenty of rocks and the rapids are shallow. Don't bother going below Stackhouse from 1200 cfs down, super scrapy (and even at 1200 cfs everything below there isn't worth the paddle). Sandy Bottoms wave (next to FBRC lunch spot) is nice and wide around 1000-1200 cfs, although rather short in height. 1,300-1,900 Medium Low Good level for folks just learning. The rapids are all there. Eddy lines and surf waves start to get fun, although the Sandy bottoms wave is pretty poor at most of these levels. 1,900-2,500 Medium The rapids start to get fun. Many more surf waves form above 1900 cfs. Big Pillow is a cartwheel spot around 2000 cfs as well. 2,500-3,500 Medium High The river turns much more into wave trains than Rock Gardens. Surf waves abound, although there isn't any eddy service for most. The bright orange/brown water is freakish. 3,500-5,000 High Even whitewater snobs will enjoy the river from here up. Some rapids start to get largish holes, but nothing to really worry about. 5,000+ Yahoo! I've only done it a few times between 5000 cfs and 8000 cfs. Really, Really fun. More like the New in West Virginia. Waves of 6-8 feet. Zero technicality, just miss a couple of holes. 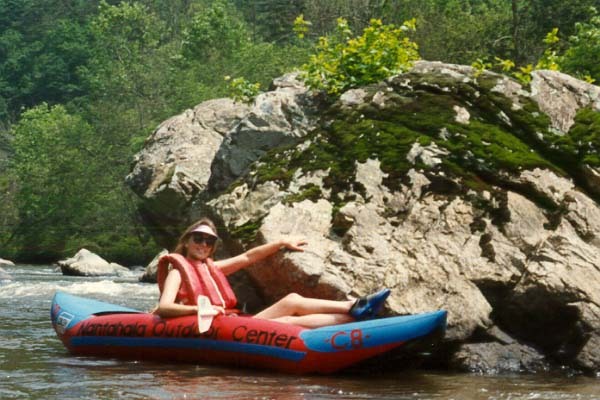 For descriptions of the many runs in the Asheville area less challenging than Section 9 -- including seven on the French Broad -- see Betsy Mayers' Paddling Asheville: 28 Gently Exciting Regional River Trips. This very well done guide for those interested in paddling class I-II in Western North Carolina and East Tennessee includes put-ins, take-outs, directions from Asheville, landmarks by river mile, excellent maps and general comments. For less detailed descriptions of every run on the French Broad from its headwaters near Rosman, NC into Tennessee, see Bob and David Benner's Carolina Whitewater: A Canoeist's Guide to the Western Carolinas. Copyright © 2000-2002 [Chris Bell (email), Asheville, NC]. AKA Beginer (Class II-): This rapid starts more or less at the put-in. It is an easy rapid and fairly long. There are a couple places to surf at most levels. If you have any trouble with this rapid, it's a really good idea to get out on river right and carry your boat back to the put-in. Most people run down the left side and angle back right near the bottom. At flows above 1500 cfs there are lines on the right. If you have trouble here see the warning on beginning rapid. It will be a slightly longer carry back to your vehicle. Maze is a long rapid. There are many rock ridges that if you are travelling from 6 o'clock to 12 o'clock will cross at a 1 to 7 o'clock alignment. There are many breaks in each of these rock ridges, so there are several ways through each. With well over a dozen ridges, there are over a thousand permutations and combinations of ways down. In general there is always an open and easily readible path on the right. There are several good technical lines. Not a rapid but a popular cliff to jump off of into a pool above Turtle Rock rapid. I have to give it a rating so class 1. The Turtle Rock for which the rapid is named is about halfway down on river left (looks sort of like a snapping turtle). The most common line is 8-10 feet to the right of the Turtle's snout. There are a lot more lines in the center / right of the river. There are many lines through S Turn. The photo shows the most common and the one for which the rapid was named. This line straighens out at 3,000 cfs so no turn is required there. A couple of the most common alternate lines - Left with an eddy turn (in a location that begs you to eddy out on the left) with a peelout that takes you back to the center and another, catching an eddy in the center of the river just above the rock island with the tree growing on it and heading toward river right from that eddy. From the short pool below S Turn, you will see a horizon line with a lot of rocks on river right and a huge opening on river left. If you head toward the center of that opening, you will see a wave train that starts out modestly and gets progressively larger as it crashes into the Big Pillow rock. In this photo, taken at 1640 cfs, the "pillow" rock is approximately in the center of the photo with a little of the top out of the water. At 2000 cfs you can't see the rock from upstream only the pillow and aerated water. There are many strategies for running this rapid. At levels up to 4500 cfs, the easiest line is to ride the initial ramp more or less down the center, then get on the right side of the wave train, angle right, and paddle right to the fairly large eddy on the right side. Boaters with more skill will want to catch the eddies on the left and right on the way down. Not a very difficult rapid. The river is split by a boulder and most boaters will run to the obvious channel on the right. . There is a significant fold in the current; this make a great squirt spot for those into squirting. Capable of mystery moves if you have a squirt boat. It also create some downdraft, such that jumping in off a raft will get a swimmer a little down time and they come back to the surface a bit downstream. At one time it was a popular option on rafting trips and thus the name. Most of the water in Sandy Bottom goes to the left of the large relatively flat center rock, creating a long wave train. You can crash through the wave train or ride either shoulder for a tamer run. At levels above 2000 cfs there are easy lines to the right of the center rock. It's a popular surfing spot and lunch spot. There are sandy beaches on river right and rocks with inlets on river left. Shortly after the pool below Sandy Bottom, the Ledges start. This rapid is long and frequently split by rock islands. The right sides are almost always good (top one may be marginal at very low flows) and most of the ones in the center and left are good also. When you get to a point where there is a small sandy beach on the right with a large whale shaped rock on the downstream end of the beach the crux ledge is just below you. The normal line is following a wave train about 30 ft off the right bank over the drop. This leads you on a mostly glassy tongue between two holes. At levels above 2,000 cfs another easier line is open about 8-10 ft off the right bank (at levels above 4500 cfs it is nice to know that this alternate line is there. There is a more interesting more technical pair of lines on the left side of this same ledge. Large areas in the center of this ledge are pourover-ish and can be very testy above 3500 cfs. The photo shows a had paddler running the classic line, splitting the wave holes at 1850 cfs. At 4000 cfs these holes are best avoided. There are several good surfing / play spots in this rapid, including a couple just above the pool before Pinball. After the pool below ledges the river is split by a large beautiful island - a perfect camping spot. The rapid on the left is Pinball. Apparently named for the technique used by some rafts to get down this side. Most boaters will start about 15-20 ft off the left bank and follow the flow until they come to Decision Rock. Unless the river is very low, you won't actually see Decision rock but it forms and obvious sizeable pillow about 2/3 of the way down the rapid. At levels below 3,000 cfs, your decision should be to go to the right of the rock as the left side has sieves. Above 3,000 the left side is covered. The photo show a boater passing Decison rock at 1850 cfs. Skilled boater can catch several eddies on the way down Pinball. The last one on the right sets you up for a nice little chute between a couple boulders. Pit Stop is on the right side of the large island below the ledges. There are multiple lines on the right side of the island; the most common is shown in the photo. It is between the right bank and a boulder on the left. The gap is about 15 ft or so wide and you go right down the middle. This line becomes progressively more difficult with higher water levels and at 3,000 cfs it is no longer easier than Pinball. At around 5,000 cfs it gets harder than Pinball IMHO. There is a flat and relatively shallow pool after Pinball / Pitstop. At the downstream end of the pool is an island on river left and the lower end of this island, Rebar rapid begins. It isn't truly rebar but there are many old steel spikes on the right 3/4 of the river from an old diversion dam. At levels below about 2500 cfs these spikes are visible. At 3000 you can still see a few. The best water for paddling is on river left where there are no spikes. The place with the most flow (and most obvious line) goes over a sloped 2 ft drop with a couple diagonal wave holes. You can easily punch them or can avoid them by angling left on the way down the drop. There are lots of ways to run Stackhouse and if you've made it this far they should seem easy. The most straightforward (easy) is to start left center and after a drop, finish left. It's a tad more fun to start left and after the drop finish anywhere. This section contains two substantial rapids. Kayak Ledge(III)and Frank Bell's rapid (IV). Both of these rapids can be avoided without portaging. When running shuttle, you need to turn right on to walnut street, NC 1150 in order to reach 1151. not positive on the name being walnut, but you should be able to find it. Just remember that 1151 isn't right off of the main road and you need to turn right onto another road first. it in a section called "Lover's Lane". a chance to run it this high. The jon boat had been making it's way downstream for a while. It is no longer in Kayak Ledge and we've seen no sign of it all the way to Hot Springs. I would disagree with "S-Turn" being a class 3-. It may have class 3 consequenses (though there is a very long, flat recovery pool afterwords), but it is an easy rapid. As for the Ledges, I would say that the 3rd ledge (the biggest ledge) is the best playspot, but the other holes are not bad too. I also like the sandy bottoms wave at the bottom of the rapid. Right Side of PillowCase OPEN but Use caution. Approaching the right side line in Pillowcase, above Big Pillow. On weekend of May 13-14/2017, there was a log across the entry chute at 2700 right at water level. Put there by flows of 11,500 the week before As of 5/26 that log has been removed - pulled over to river right side. Currently the chute on right side at PillowCase is OPEN, but use caution if flows go over 10,000 again - there are several large trees in the river in the first two miles of Section 9 that could wash into that gap. See discussion in the river description below. Attention Southeast Boaters! Like Music?? Like Boating?? Check out the 10th Annual French Broad River Festival this Spring. This benefit for AW is happening May 4-6 in the metropolis of Hot Springs, NC and features the best music lineup of any river festival in the nation!! Over 20 bands including The Gourds, The Drew Emmit Band, Afromotive, Big City Sunrise, Sol Driven Train, Hypnotic Clambake, The Greasy Beans and more. 10th Annual French Broad River Festival DVD. The party will start around 8pm...the movie premier will start at around 9pm and the Trainwreks will start around 10pm. We should also have a few musical guests join in here and there, as well. The best part about this party is that it is FREE!!! That's right...FREE! Each May lovers of rivers and music gather on the banks of the French BroadRiver to celebrate the mountain lifestyle at the French Broad River Festival. The festival gives back to the community by raising funds for the river stewardship work of American Whitewater and various local charities. At the 2008 French Broad Festival American Whitewater is partnering with Riverlink, an organization dedicated to protecting and restoring the French BroadRiver, to encourage river stewardship in paddlers by organizing a river cleanup on the French BroadRiver. The river cleanup will be hosted by the NantahalaOutdoorCenter, national partner of American Whitewater on Friday, May 2, 2008. Recently, American Whitewater teamed up with the good folks at Riverlink, the Nantahala Outdoor Center and a bunch of super volunteers to do a cleanup on the French Broad River in North Carolina. Heavy winter flows had unfortunately pushed a large amount of trash into the river. By the end of the day, the cleanup crew had picked up over 30 bags of trash, 15 tires and even two large sections of plastic drainage tubing.